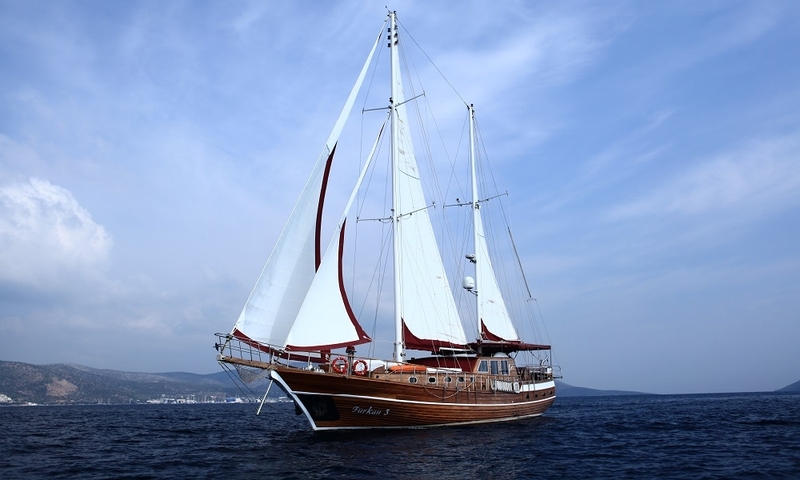 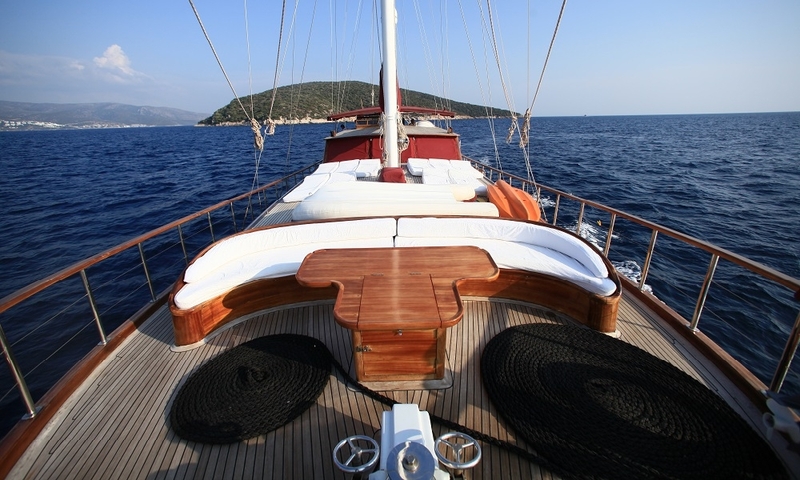 The Deluxe gulet Furkan 3 is one of the best value luxury gulets based in Bodrum, offering a family or a small group just four comfortable cabins and an abundance of outdoor areas within her elegant 26 metre all wood hull, perfect for relaxing and enjoying the pleasures of a gulet cruise on Aegean seas. 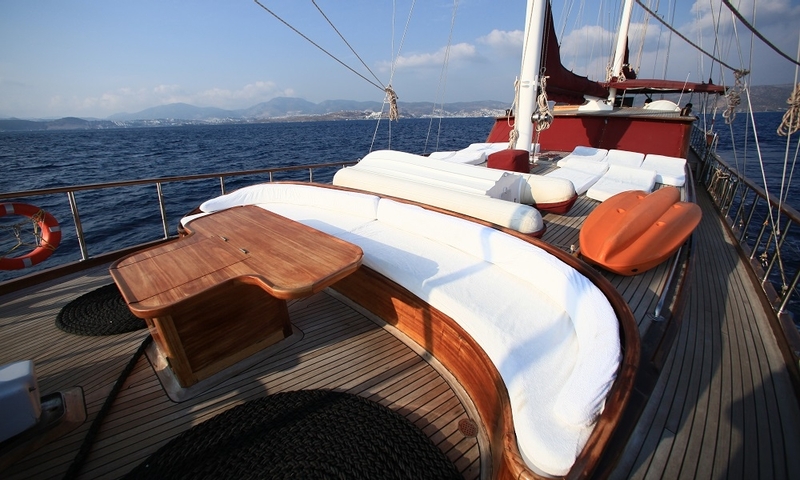 Though built in 2010 as a modern design of the traditional wooden ketch gulets of Bodrum, she has been refurbished again in 2014, and offers all the delights of technology fitted discretely to give a very comfortable experience, while preserving a very nautical atmosphere with the beautifully crafted wood paneling and finish in all cabins and the saloon. 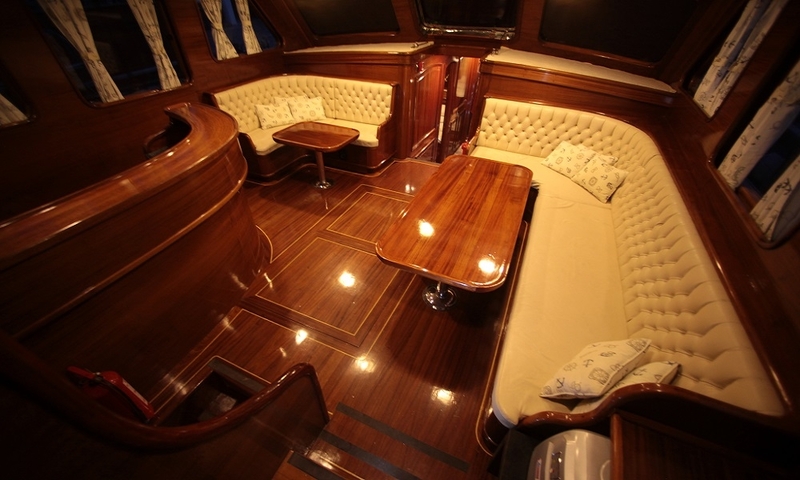 Meticulous care and polish by the crew makes sure it does gleam. 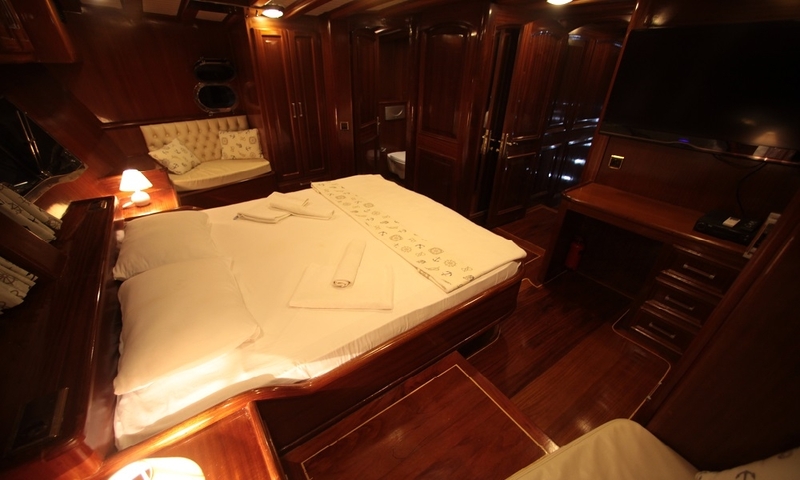 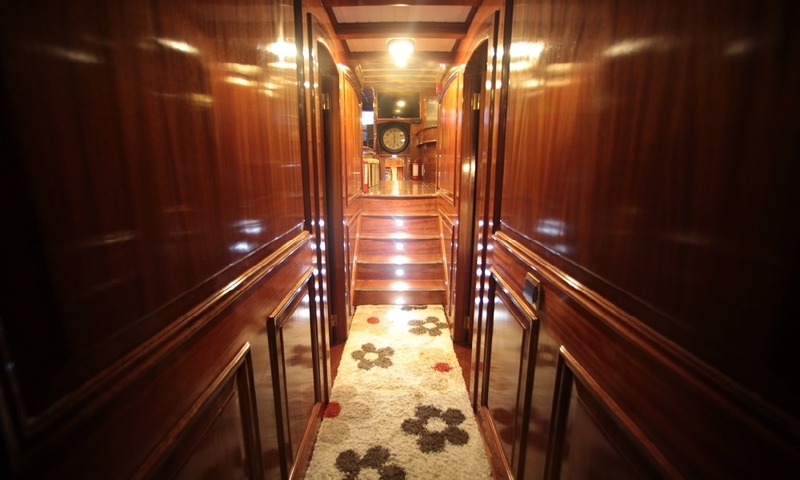 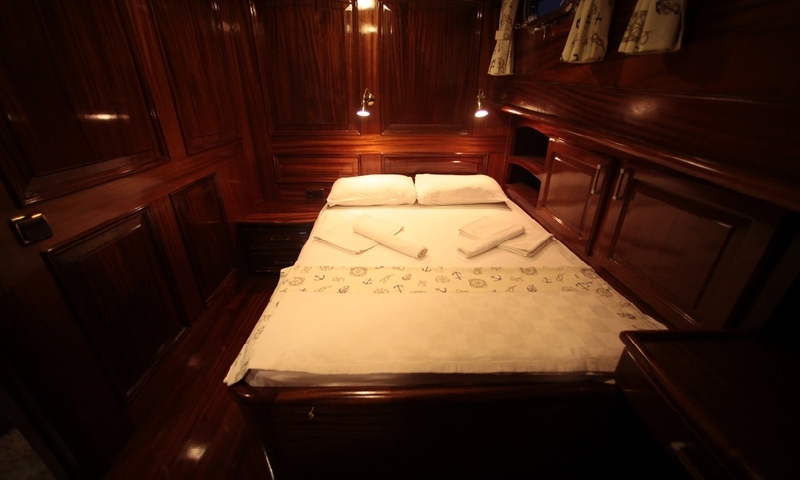 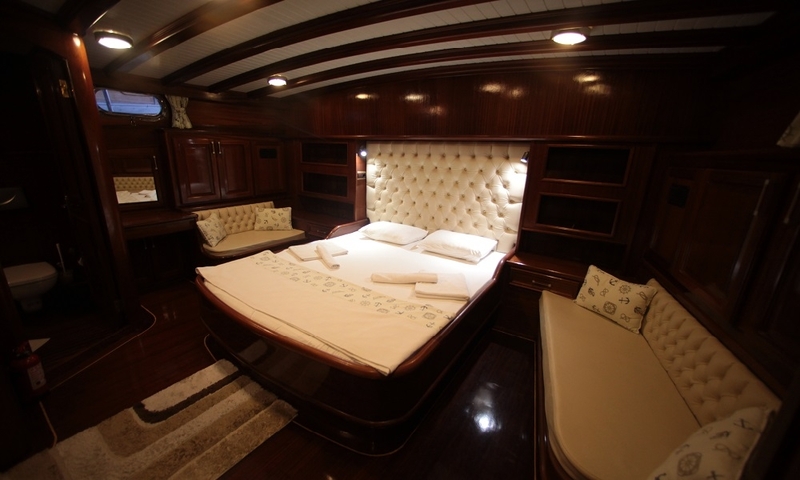 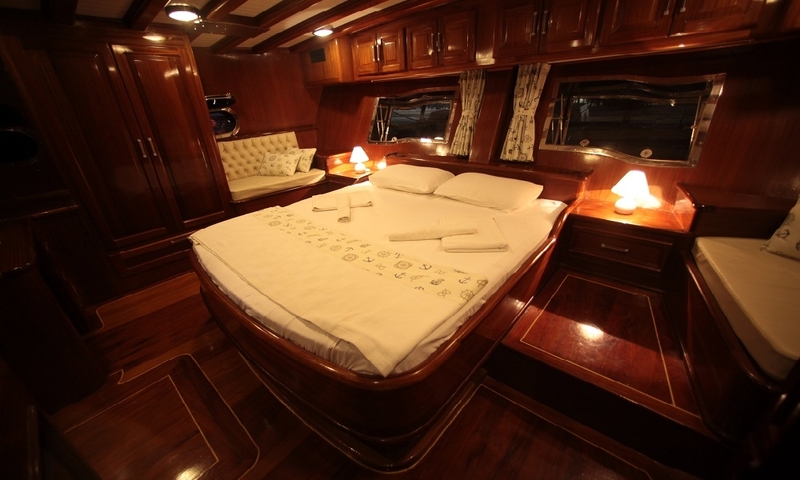 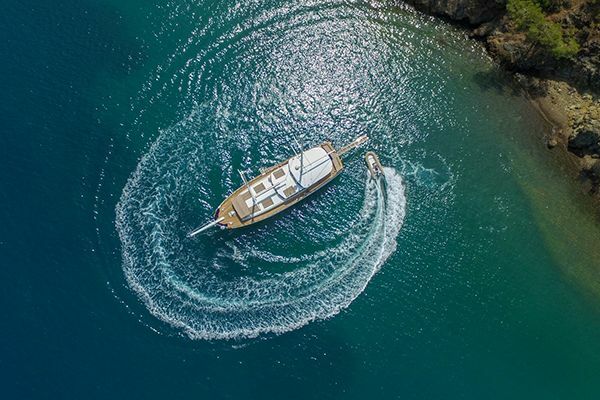 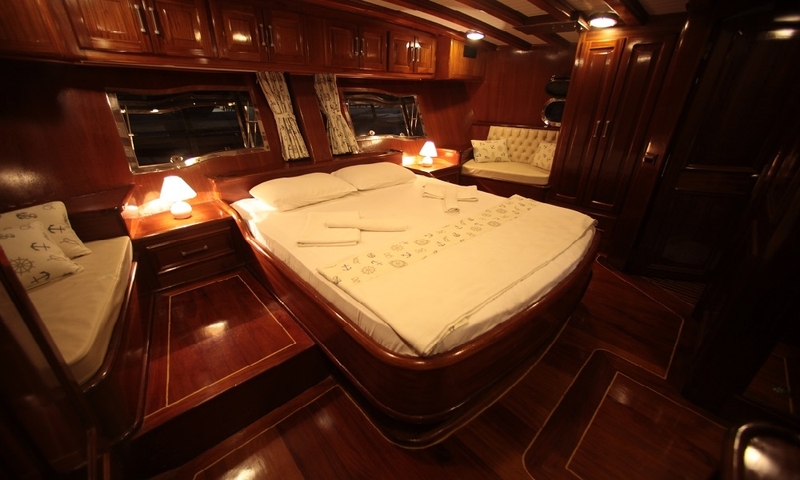 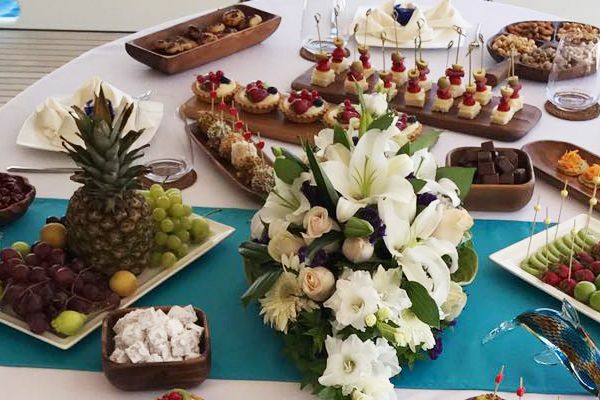 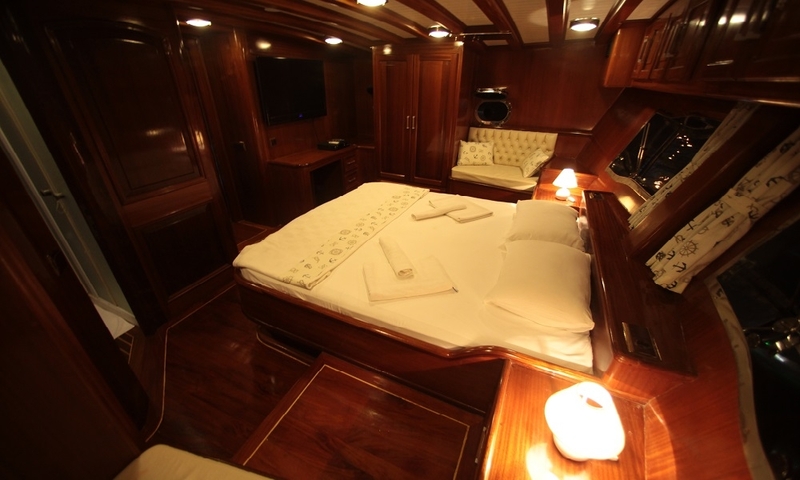 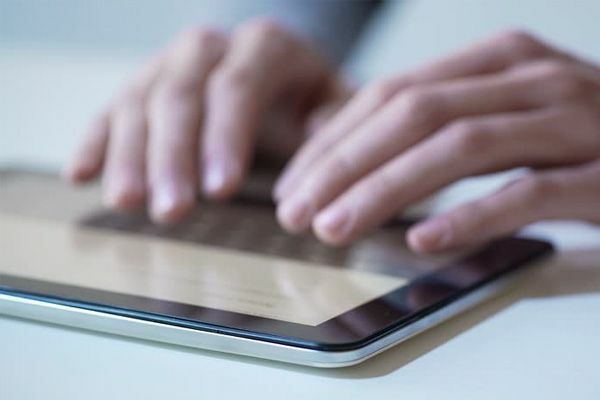 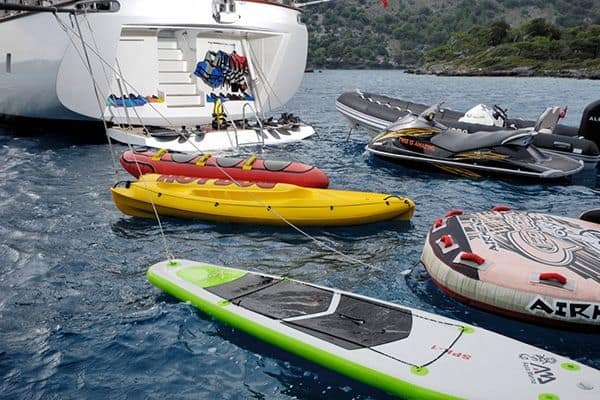 Turkish gullet Furkan 3 offers an accommodation of two spacious master cabins with walk around double beds, one double bed cabin, and one twin bed cabin offers most options necessary for a group or a family. 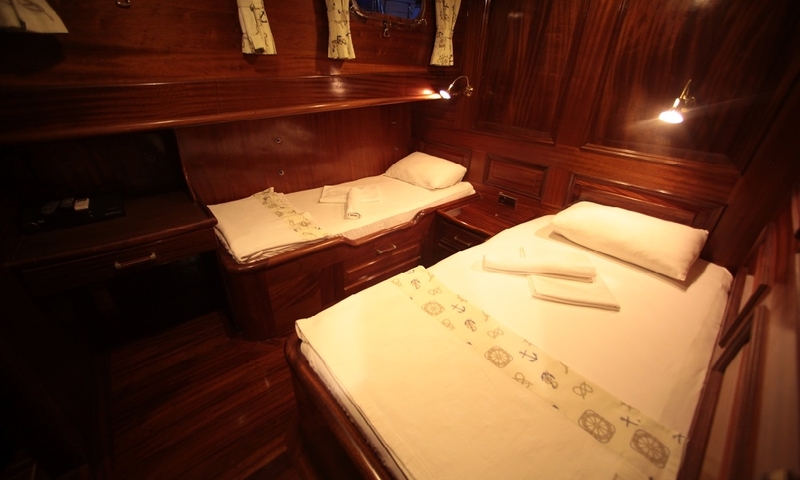 The twin and double cabins are located beside the forward master cabin, while the aft master cabin in the stern enjoys the full light from the windows. 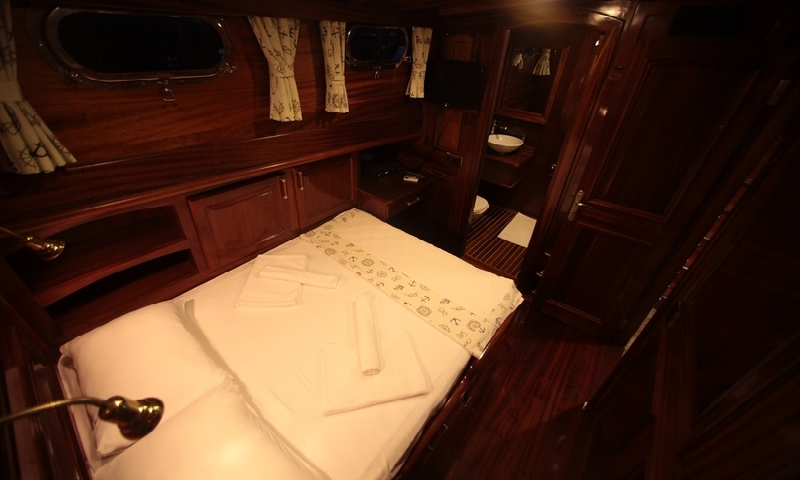 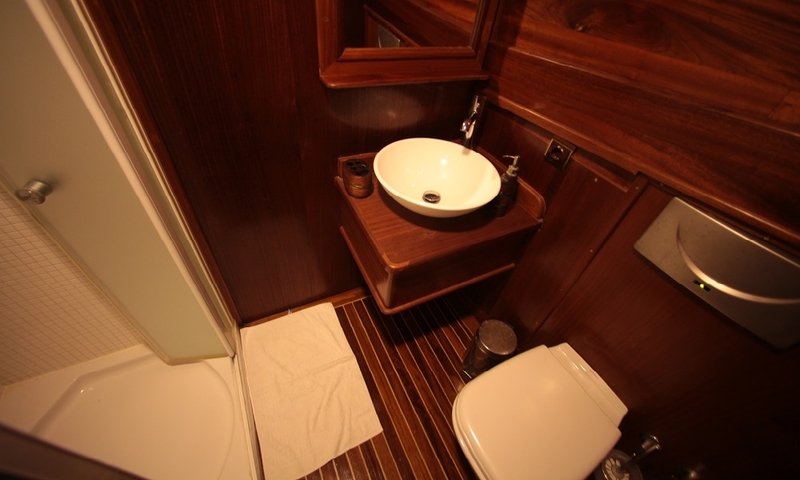 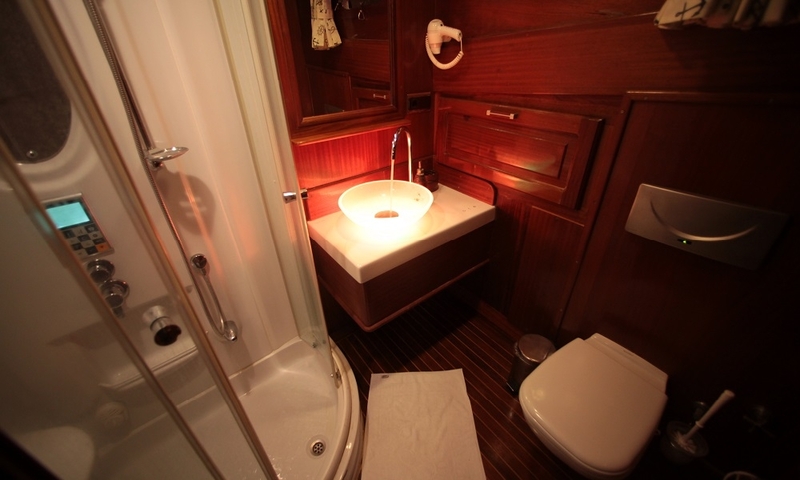 Each air-conditioned cabin has a television and its own en-suite bathroom with hydro shower. 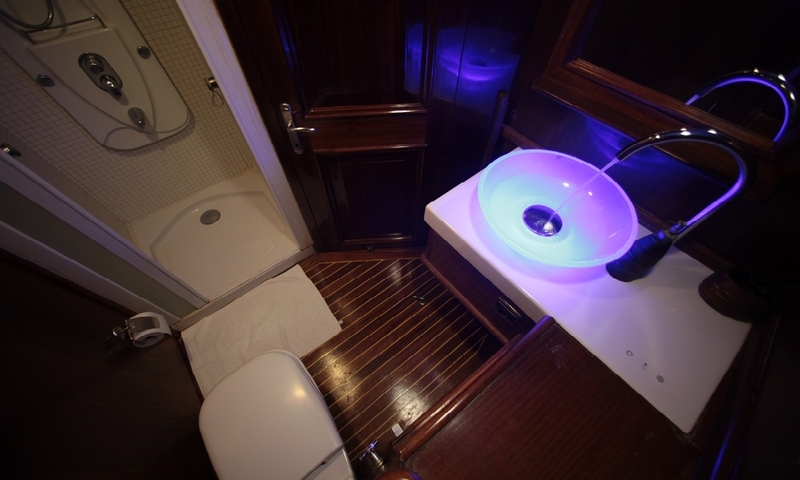 The master cabins have large HD televisions with satellite, wardrobe hanging space and the forward master cabin has a minibar and a vanity desk. 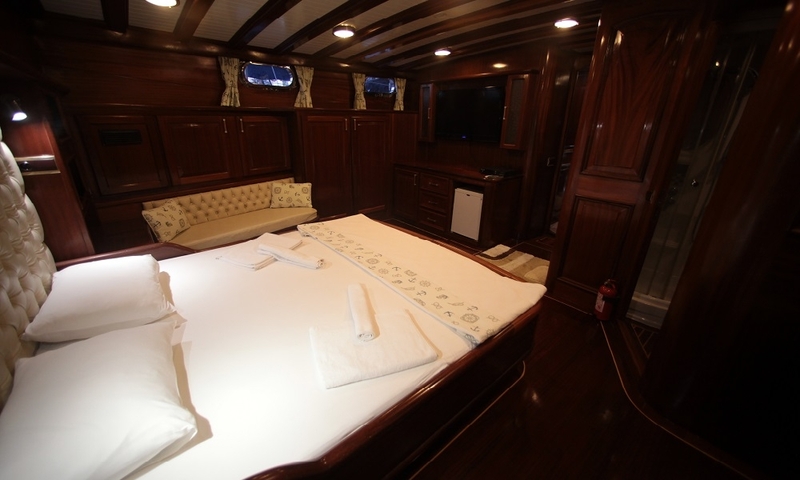 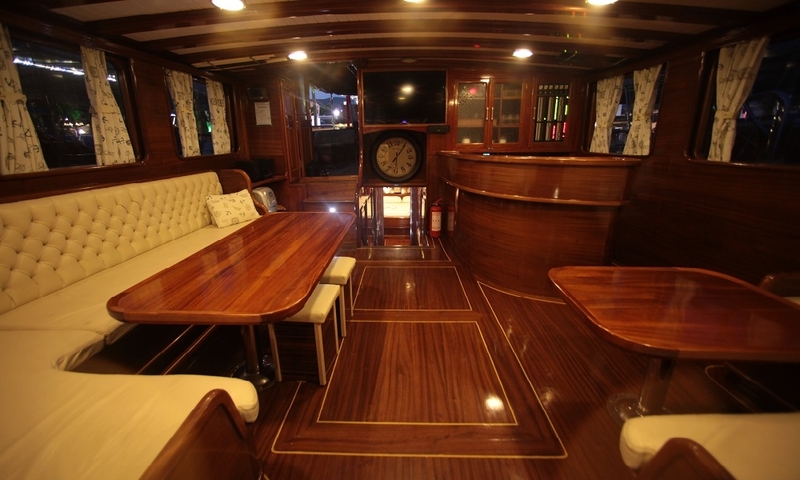 The air-conditioned saloon on boat Furkan 3 offers a comfortable indoor dining space with well-cushioned long banquette seats around two tables, also ideal for enjoying the large HD television and music system. 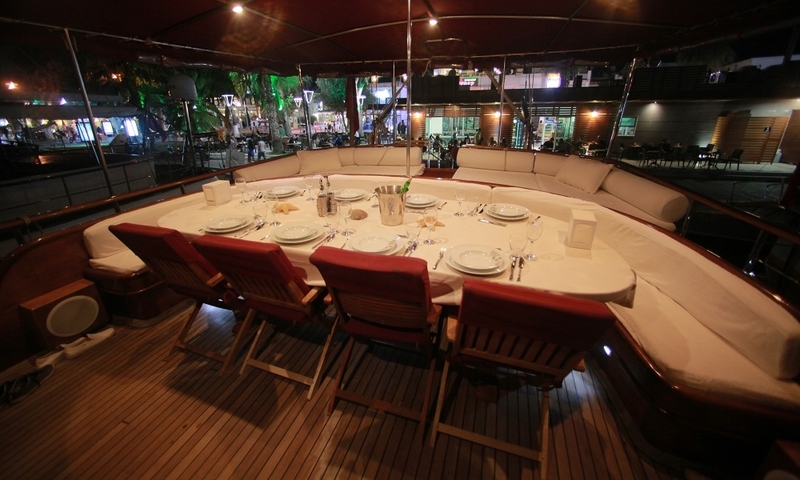 On the aft deck the curved seat separates the large dining table from the inviting cushioned pad across the stern, all under the fixed shade awning. 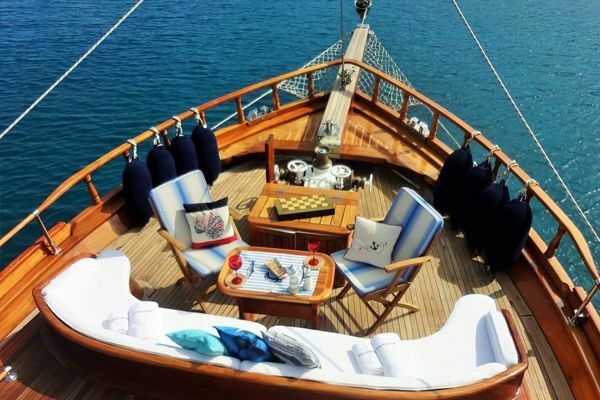 The individual sunbeds are arranged on the fore deck, while the long bow seat and small table is the perfect spot for enjoying the sun and views, or an evening sunset drink. 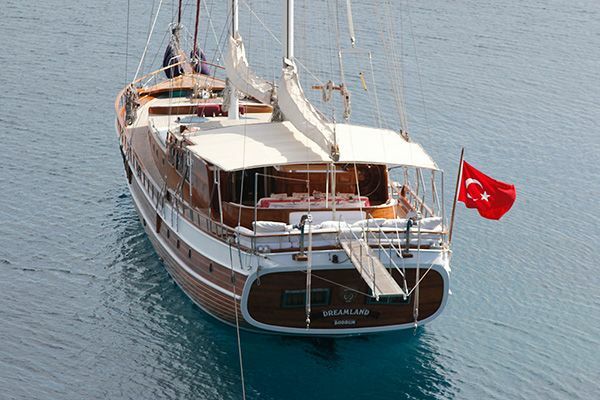 The Captain and crew will see to all the guests needs, serve delicious meals and manage the gulet for everyone’s comfort, and also see that the active guests can enjoy the water toys in the some of the many beautiful bays along the Turkish coast, or when the gulet Furkan 3 cruises amongst the nearby Greek Islands.